The best shade sail manufacturers in Melbourne trust only Rainbow Shade fabrics! As with most Australian cities, Melbourne experiences an oceanic climate but weather conditions change frequently. While there is plenty of sunshine, severe thunderstorms, hail, strong winds and heavy rain are not uncommon. So, you can understand why Melbourne residents need all-weather protection in the form of shade sails. Fortunately, Rainbow Shade offers high quality shade fabrics which are designed to meet Melbourne’s conditions. 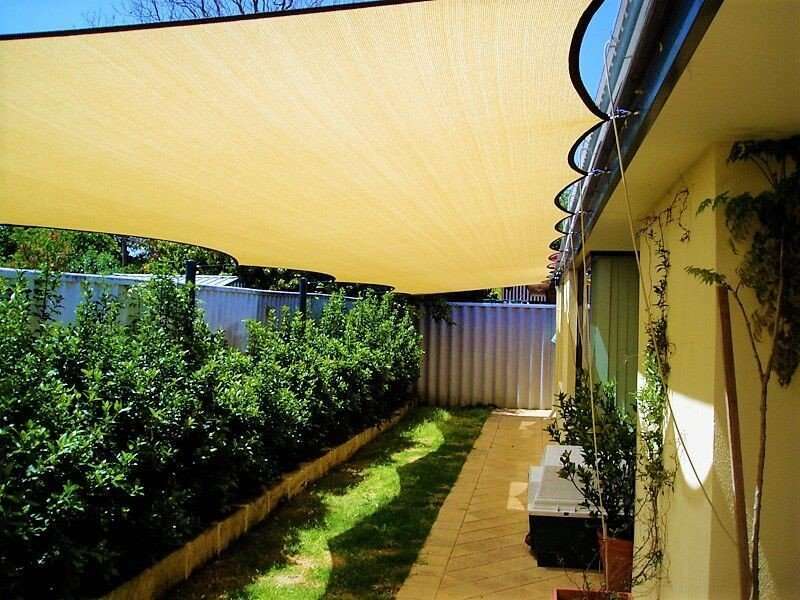 As Australia’s leading shade fabric supplier, our products are the preferred solution for by manufacturers of shade sail in Melbourne. Don’t let Melbourne’s moody weather conditions get the better of you. Shade sails made out of our versatile fabrics can offer protection from the sun, rain and wind. When you choose shade sails made from a Rainbow Shade fabric, you can count on comfort and enjoyment. Rainbow Shade offer shade fabrics that are suitable for just about any application. Regardless of the season, our shade fabrics can provide you all-weather protection. Our complete shade fabric range is available to Melbourne shade sail manufacturers. More information about our shade fabrics is detailed below. eXtreme 32 is a popular commercial grade shade fabric that is extensively used in large shade sails across Melbourne. You’ll find this fabric used in school and kindergarten playground shade sails, car parks shade sails and backyard shade sails all over the city. eXtreme 32 offers UVR protection of up to 95.8%. Its durability, resilient to wear and tear, exceptional strength, flame resistance and low- maintenance are some reasons why eXtreme 32 is perfect for such applications. For more information, visit the eXtreme 32 product page. Z16 is an extremely popular shade sail fabric in Melbourne for small and medium sized applications. Shade sails made out of Z16 are used in schools, car parks and residences. This fabric is available in a choice of 22 designer colours, allowing shade sail manufacturers to offer creative designs. Z16 is lightweight, durable, easy to maintain and offers excellent UVR protection of up to 99%. For more information, visit the Z16 product page. DRiZ is a special blend of Z16 with a waterproof coating to offer all-weather protection. Available in 16 designer colours, DRiZ is the preferred choice for shade sails in schools and kindergartens, cafes and restaurants and domestic residences across Melbourne. This fabric is incredibly lightweight, features high tensile strength and exhibits proven durability and longevity. It also offers unmatched UVR protection of up to 100%. For more information, visit the DRiZ product page. Mehler is our most resilient and durable waterproof fabric in our product range. Made out of high grade waterproof PVC fabric, Mehler is suitable for use in demanding commercial applications that require all-weather protection. This superior fabric is tear resistant, flame retardant, durable and dimensionally stable. Mehler is also UV stabilised and easy to maintain. For more information, visit the Mehler product page. Why choose shade sails in Melbourne that are made of Rainbow Shade fabrics? We concentrate on three aspects in our shade fabrics which determine high performance and quality, which are knit design, colour pigments and UV stabilisers. Shade sails made out of our fabrics are far better than cheap shade sails and can last up to 10 times longer. Moreover, the UVR protection offered by our fabrics is unmatched in the market. All our fabrics feature high strength, high coverage, quality colour pigments and grade-A UV stabilisers. This means that shade sails that use Rainbow Shade fabrics are far less likely to loose shape and will hold colours for longer than inferior products. We offer limited warranties ranging from 10-20 years on our shade fabrics. You’ll have no trouble finding Rainbow Shade fabrics in Melbourne. We supply our fabrics to shade sail manufacturers in Ascot Vale, Avondale Heights, Burnside, Cheltenham , Coburg, Dandenong South, Essendon, Heathmont, Maidstone, Maribyrnong, Montmorency, Noble Park North, Parkdale, Ringwood East, South Kingsville, Upwey, Warranwood, Westmeadows, Wheelers Hill, Yarra Glen and everywhere in between. So give us a call today and we’ll put you in touch with a Rainbow Shade partner nearest to your location. Don’t fall for inferior shade sails in Melbourne – only choose high quality shade sails that use Rainbow Shade fabrics.